Morgan’s artistic skill and ability is without question. Morgan painted a beautiful mural in the sexual assault examination waiting room on the VMC campus. We absolutely love it. She was able to incorporate the client’s needs and strike the perfect tone with her design. She is so talented, but frankly the best part of working with Morgan is that she was on time, reliable, professional, and she started when she said she would and finished when she said she would. She provided sketches and brought the client’s vision to life. I think Morgan is the perfect blend of tremendous left brain artistic skill and right brain business management. You can’t find a better muralist. 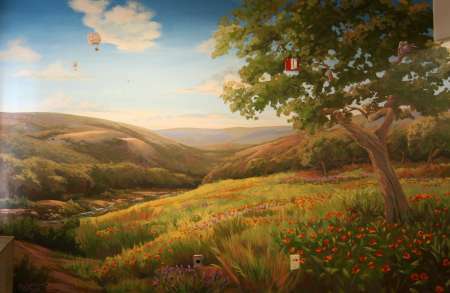 Under Morgan’s magic touch, our drab, institutional waiting room wall has become a wildflower meadow under fluffy clouds and soaring hot air balloons. We’re all jealous of our receptionist! It was a joy to deal with the artist. We found her to be both creative and very considerate of our desires, and to be prompt and as unobtrusive as possible under the circumstances. We couldn’t be more pleased. View more photos of landscape murals Morgan has painted.